Sony, Gearbox Software and 2K games delivered a very special announcement at this year's Gamescom for Sony Borderlands fans. 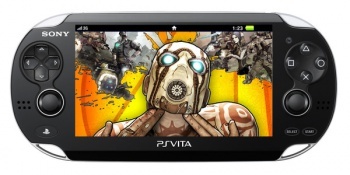 Hit co-op shooter Borderlands 2 will be making it's way to Sony's handheld platform, the PS Vita, some time next year. The port is being handled by Iron Galaxy Studios - makers of indie fighting game Divekick, and we be published by Sony Computer Entertainment. "For the last year, Gearbox Software, 2K, and PlayStation have been inundated with emails, tweets, forum posts and more from passionate gamers across the world pleading for a PS Vita version of Borderlands 2," says Gearbox Software's Product Manager Adam Fletcher in a blog post. "You spoke, we listened ... we can finally make Borderlands 2 on PS Vita a reality!" The announcement only specifically mentions the original four vault hunters, the Siren, the Gunzerker, the Commando, and the Assassin, with no mention of the Psycho and the Mechromancer. It looks like, for now at least, the PS Vita version will come sans character DLC. Borderlands 2 for PS Vita will feature the same four-player co-op that the PC and console versions are famous for. "We want to thank the passionate fans for helping make Borderlands 2 on the PS Vita a reality," says Fletcher, "and we look forward to looting bazillions of guns with you guys on the go." There's no word on whether the PS Vita version will also feature the "season pass" DLC content from the PC and console versions.